Photographs are one of the most treasured possessions in any family. Unfortunately, as time goes on, the photographs get old, stained, fade out, or get otherwise damaged. In order to preserve them, most people try to digitize photos to pass these cherished images onto future generations. AKVIS Retoucher 1.3 is a specialized digital image retouching and photo restoration application that automatically edits scanned images in order to remove cracks, specks, spots, dust and scratch marks or other signs of damage. In addition, the program can remove logos, text or date stamps from digital images. Most importantly, this application is very straightforward and can be used by any amateur photographer who has never performed retouching/image restoration before. In order to remove a defect, all a user has to do is to select the damaged area and press one button. The rest is done automatically. Essentially, AKVIS Retoucher makes photo restoration and scratch or dust speck removal a task any person can do himself. The program processes both black-and-white and color photos and comes with a game-like tutorial, so any person can master the program within minutes. 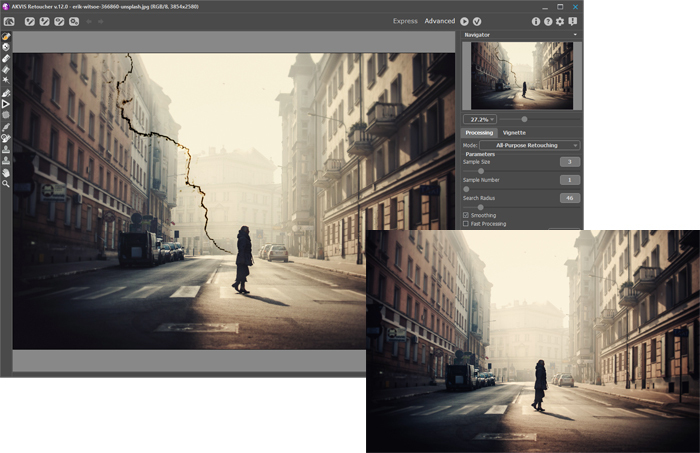 AKVIS Retoucher 1.3 is available as a plugin for Adobe Photoshop, Photoshop Elements, Corel Photo-Paint, Jasc Paint Shop Pro and other digital imaging software that supports third-party plugins. AKVIS LLC is an independent software developing company specializing in digital image processing software. The company is developing a line of unique image edition software application that currently includes AKVIS Retoucher and AKVIS Chameleon. The company offers licenses to non-profit organizations (like heritage foundations and historical societies) involved in photo restoration projects free of charge. If you have any questions, would like to request editor's copy, want to inquire about special prices for volume buyers/software resellers, or have a business proposal, please contact Sergey Galenko at ceo@AKVIS.com.